Uppsala, Sweden / Embedded World, Nuremberg, Germany—February 23, 2015—IAR Systems®, the leading vendor of embedded development tools, is proud to introduce its latest product innovation C-STAT®. C-STAT provides powerful static analysis and is now available fully integrated in the high-performance development toolchain IAR Embedded Workbench® for Texas Instruments’ (TI) MSP430™ MCUs. Important concerns for embedded developers today include adherence to coding standards as well as increased application complexity that might interfere with code quality. Using a flexible static code analysis tool like C-STAT addresses both these issues by detecting potential code errors in complex applications and by ensuring compliance with coding standards applicable for embedded applications in various segments. C-STAT is a powerful static analysis tool that executes fast and provides analysis results directly in the IAR Embedded Workbench IDE. It checks compliance with rules as defined by coding standards including MISRA C:2004, MISRA C++:2008 and MISRA C:2012, as well as hundreds of rules based on for example CWE (the Common Weakness Enumeration) and CERT C/C++. Users can easily select which rule-set or which individual rules to check the code against. The tool detects potential code errors including for example memory leaks, access violations, arithmetic errors and array and string overruns. By finding such errors early, developers can take full control of their code and lower the risk of breaking the budget and deadline for a project. 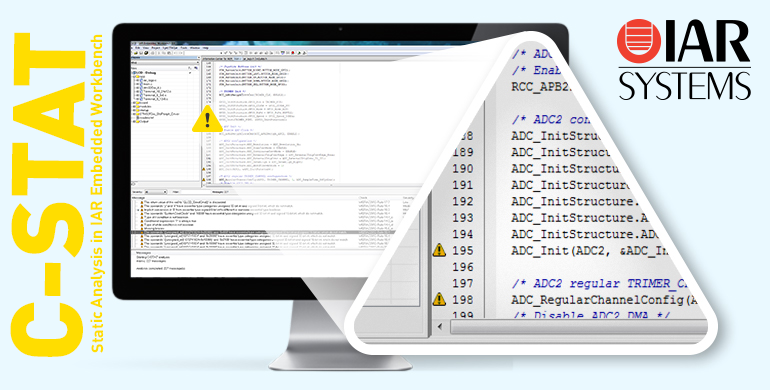 C-SPY® Debugger in a user-friendly integrated development environment. C-STAT is available for IAR Embedded Workbench for MSP430 from version 6.30, as well as for IAR Embedded Workbench for ARM® with support for more than 3,000 ARM-based devices. All products are sold with access to IAR Systems’ renowned technical support available in multiple time zones. Read more about C-STAT at www.iar.com/cstat and about IAR Embedded Workbench for MSP430 MCUs at www.iar.com/ew430.